June 21, 2018 — On March 15, 2017, U.S. president Donald Trump addressed carmakers at a newly constructed test track for self-driving cars and other mobility technology, the American Center for Mobility, in Willow Run, Michigan. “We’re going to work on the CAFE standards so you can make cars in America again,” he said. The U.S. Corporate Average Fuel Economy (CAFE) standards were created more than 40 years ago under President Gerald Ford to improve the energy efficiency of vehicles. Since then, the standards have become increasingly stringent, with an eye toward goals such as reducing oil consumption and air pollution. The most recent standards, imposed by the Obama administration in 2012, originally aimed to require that the fleet of vehicles manufactured for sale in the U.S. in 2025 achieves a fuel efficiency equivalent of 54.5 miles per gallon (mpg). This past April, the Trump administration began walking back the CAFE standards. It suggested the 2025 standard be ratcheted down to the standards Obama set for 2020, roughly 36.4 mpg. The original CAFE standards, set in the mid-1970s, called for a near doubling of average fuel efficiency from 15.3 mpg to 27.5 mpg by 1985. They were prompted by the Arab oil embargo, which resulted in long lines at gas stations and a spike in gas prices. The fuel economy standard stayed essentially constant over the ensuing decades. Then, in 2008–09, a dramatic spike in gas prices due to a variety of factors, a president supportive of reducing greenhouse gas emissions and a domestic auto industry facing bankruptcy provided momentum for significantly upping the standards. In 2012, the Obama administration decided to gradually increase the CAFE standard to 54.5 mpg by 2025. Some of the vehicles in the fleet can fall below the standard as long as others exceed it. The standard in reality is lower, since it is based on a lab test that exceeds what everyday drivers would experience on the road and automakers get credits for measures like producing extra clean vehicles and reducing leakage from automotive air conditioners. Under the law, larger vehicles such as pickups and SUVs have a lower fuel economy requirement than cars. The regulation included a provision for a midterm review, in which EPA would determine by April 1, 2018, whether it was feasible to meet the 2025 standards with existing technology. In January 2017, EPA issued the results of its mid-term review, upholding the 54.5 mpg requirement. But in March 2017, EPA administrator Scott Pruitt reopened that review with an eye to making the requirement less stringent. What would a strict standard mean for the mix of vehicles on the road? Companies have not been making more small, less safe and less desirable vehicles in preparation for the tighter limit, which insurance companies, manufacturers and dealers had feared. “They’re just taking the same vehicles and making them more fuel efficient,” says Benjamin Leard, a research fellow at Resources for the Future. Studies by the International Council on Clean Transportation cite innovations in fuel efficiency technologies, including turbocharging and materials that reduce the weight of vehicles and so reduce the amount of fuel required to drive them. ICCT found that new technologies could reduce weight 15 percent by 2025 at costs that are a third of those estimated in EPA’s initial rule. In materials supporting its 2017 decision, the EPA projected that the 2025 standards could be met with 75 percent of the fleet having internal combustion engines and 2 percent being plug-in electric hybrids. Even so, because the standards give automakers credits for the cleanest vehicles, a tough standard “would really push the agenda for green cars and EVs,” says Jeremy Acevedo, manager of data strategy at Edmunds, an online car shopping guide. In congressional testimony in December 2017, the Alliance of Automobile Manufacturers, a trade association representing 12 automakers, painted a different picture of the future fleet. 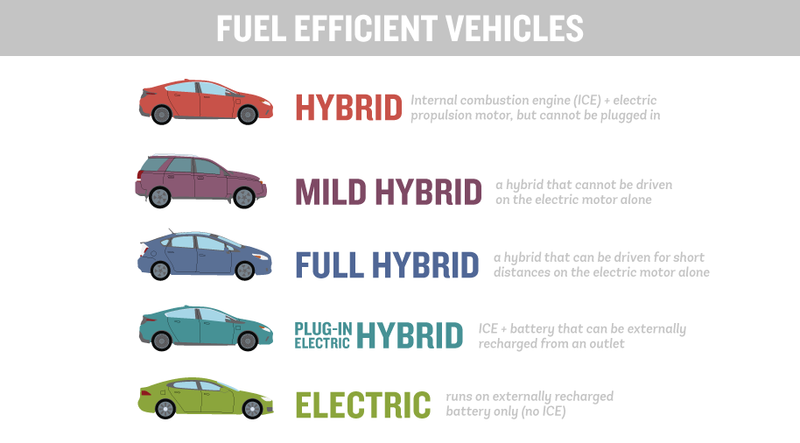 It cited a study indicating that nearly every vehicle sold in the U.S. would need to be a mild hybrid, or 30 percent of the fleet would need to consist of hybrid-electric vehicles, to meet the 54.5 mpg standard. Carmakers argue that consumers don’t prioritize fuel economy, so compliance would be eroded as more of them continue to flock to bigger vehicles or hang onto older, more polluting ones. 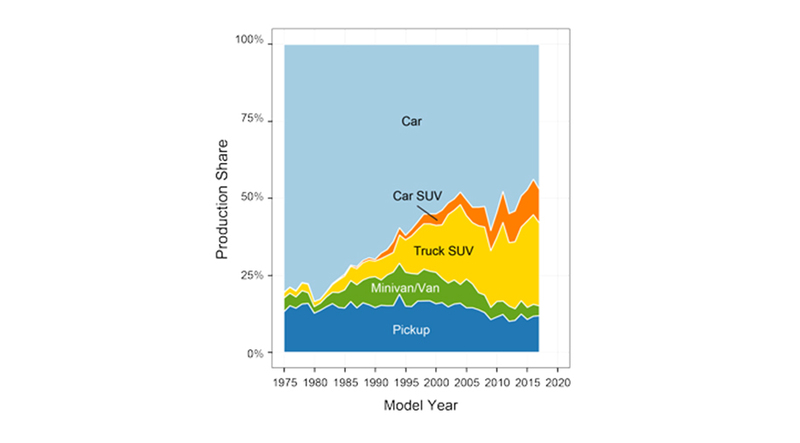 Sports utility vehicles are making up an increasing proportion of the U.S. automotive fleet. Click to enlarge. Credit: U.S. Environmental Protection Agency. Indeed, consumers typically prefer larger, higher performing vehicles that aren’t as fuel efficient as smaller vehicles. A May 2018 study by Cox Automotive reported US$4 per gallon as the “tipping point” at which gas price would influence the vehicle purchase decisions of most of the consumers they studied. Vehicle sales in May of this year show that cars comprised 32.2 percent of sales, while light trucks, which are less fuel-efficient, made up 67.8 percent of sales; green cars made up just 3.4 percent, even as gas prices were rising. A 2018 study of shopping behavior by J.D. Power found fuel economy ranked seventh in new car criteria, while interior style and comfort, exterior styling, reliability and performance were at the top of the list. Further, says Leard, carmakers earn more profit from larger, less fuel efficient vehicles, so they have long preferred to be able to sell many of them. Stanley Young, a spokesperson for the California Air Resources Board, says tough standards wouldn’t require consumers to choose between roominess and fuel efficiency. He points to several extremely fuel-efficient SUVs that are meeting the federal standards years ahead of schedule, including the 2018 model year Honda HR-V, which gets 34 miles per gallon on the highway, and the 2018 model year Subaru Outback, which gets 32 mpg. Further, Young argues, the reason EVs don’t sell well is that automakers haven’t done a good job marketing them. “When people are exposed to these cars, they find them fun to drive, comfortable, some even luxurious,” he says. With the range a car can travel on a battery now increasing to over 200 miles and battery costs coming down, he sees this as a viable choice for consumers. Van Doren agrees that EVs are high-performing cars “that accelerate like Ferraris,” but he says no one has yet figured out how to make them affordable. What would be the impact on fleet makeup if the fuel economy standard were removed altogether? Proponents of a tough standard speculate that would drive a return to the days when gas guzzlers were king. “We could see vehicles like the Hummer, catering to consumer tastes without any regard for the impact on oil demand and CO2 emissions,” DeCicco says. Since automotive companies are in the business of making vehicles that consumers crave and maximizing profits, “we would expect cars would be a lot less fuel efficient and more powerful and much larger than they are today,” says Leard. Margo Oge, who was instrumental in developing the standards as director of EPA’s Office of Transportation and Air Quality from 1994 to 2012 and is now a distinguished fellow at the ClimateWorks Foundation, predicts having no standards would ultimately spell doom for U.S. carmakers, since they wouldn’t be able to compete in international markets that now have tight fuel economy standards, like those of Europe and China. And, she says, the companies won’t be as prepared to meet domestic needs as competitors like Honda, which has a particularly fuel efficient fleet, should gas prices spike again. But H. Sterling Burnett, senior fellow on environmental policy at the Heartland Institute, disagrees. He points out that domestic auto manufacturers can still choose to pursue greater efficiency than the standards require — and so be competitive in world markets — without standards. “The only thing that changes is [that] instead of satisfying a government mandated floor and focus on fuel economy above other concerns, the auto makers will be satisfying consumer demand for the kinds of cars the public wants,” he says. Burnett says a no-regulation scenario wouldn’t discourage companies like Toyota from continuing to manufacture popular fuel-efficient vehicles like the Prius, and it could create a market incentive for larger fuel-efficient vehicles. “If such a vehicle comes to market, people will buy it,” he says. Acevedo says stiff competition in the market for compact SUVs — which have accounted for 18.2 percent of sales through May 2018 — could potentially lead to fuel efficiency becoming a market advantage. In fact, a July 2017 report by the Consumer Federation of America noted that the group of vehicles that increased their fuel economy the most between 2011 and 2016 also saw the greatest gains in sales over that period. Dave Cooke, senior vehicles analyst at the Union of Concerned Scientists (UCS), disagrees. Cooke contends that regulations are what’s driving these improved fuel efficiencies in larger vehicles, and they wouldn’t occur without them. The absence of a mandate to develop a more fuel-efficient fleet would likely have the most impact on greenhouse gas emissions. The more fuel you burn, the more climate-changing carbon dioxide goes out the tailpipe. “We can be confident that without the standards, overall emissions would be higher, both of local emissions and greenhouse gas emissions,” Leard says. The UCS estimates that the U.S. regulations to date have avoided 243 million metric tons (268 million tons) carbon dioxide equivalent of global warming emissions. Cooke says rolling back the standards even to 2020 standards would result in an excess of nearly 120 million metric tons (132 million tons) of CO2 equivalent emissions in 2030, equivalent to keeping 30 coal-fired power plants online. Henry Lee, director of the Environment and Natural Resources Program at Harvard’s John F. Kennedy School of Government, says that without CAFE standards, transportation would overtake the electricity sector as the largest contributor to greenhouse gas emissions in the U.S.
Therese Langer, transportation program director for the American Council for an Energy-Efficient Economy, says that keeping the strong federal standards in place would reduce greenhouse gases by 158 million metric tons (174 million tons) in 2035. Leard explains that though there is a “rebound effect,” where consumers drive 10 percent more when fuel economy is doubled, that still results in overall CO2 reductions of roughly 45 percent from before the standards went into effect. These emissions savings occur over the lifetime of new vehicles, so would accrue for 20 or so years post 2025. But emissions savings envisioned in the tougher standards depend not only on the ability of car companies to make more fuel-efficient vehicles, but also on their ability to sell them. Market forces alone would propel consumers to buy these types of vehicles if consumers are worried about high gas prices, Van Doren says. If gas prices remain low, however, consumers may hold off buying them and actual estimated emissions reductions from the tougher standards would be much lower. 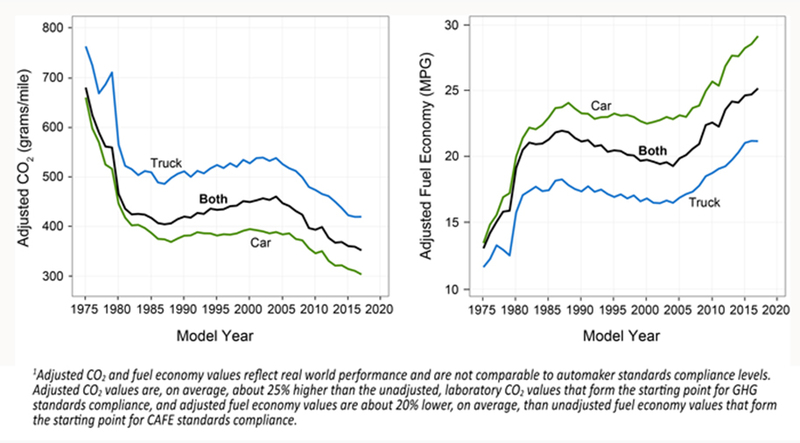 DeCicco argues that fuel economy regulations can reduce greenhouse gas emissions even if it means forcing auto companies to produce cars consumers may not initially crave. Consumers, he points out, once balked at paying more for mandated features like seat belts and air bags that we now take for granted. Consumers would buy more efficient vehicles as more of them are produced, he says. President Trump says his motivation for proposing a rollback of the standards is to bring back jobs for U.S. autoworkers. But in a May 24 press roundtable, United Auto Workers then-president Dennis Williams said the UAW doesn’t support a rollback. Other evidence suggests that the tougher standards would create jobs. A May 2017 report by BlueGreen Alliance, a partnership of labor unions and environmental organizations, found more than 1,200 U.S. factories and engineering facilities in 48 states — and 288,000 American workers — building technologies that reduce pollution and improve fuel economy for today’s innovative vehicles, two-and-a-half times as many facilities and almost twice as many jobs in this sector than the same researchers found in a 2011 report. 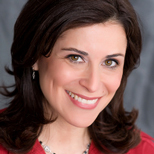 “The standards have been important to the auto recovery, and rolling them back could put domestic jobs at risk now and in the longer term,” says Zoe Lipman, BlueGreen Alliance’s vehicles and advanced transportation program director. In California, tough standards are fueling a robust aftermarket industry of companies that make air pollution and emission controls on cars, Young says. And Tesla is now one of the five largest manufacturers in California. “The growth of the green industry has been massive,” he says. Leard, however, says that “there is no credible published research answering the question about jobs.” It’s difficult to ascertain the effect of the standards on total car sales, how this effect translates to employment in the new car production sector and how this change in employment spills over into other sectors, he says. Though unemployment has fallen and new car sales have increased since the 2012 standards started taking effect, it’s hard to know precisely what factors contributed to this. 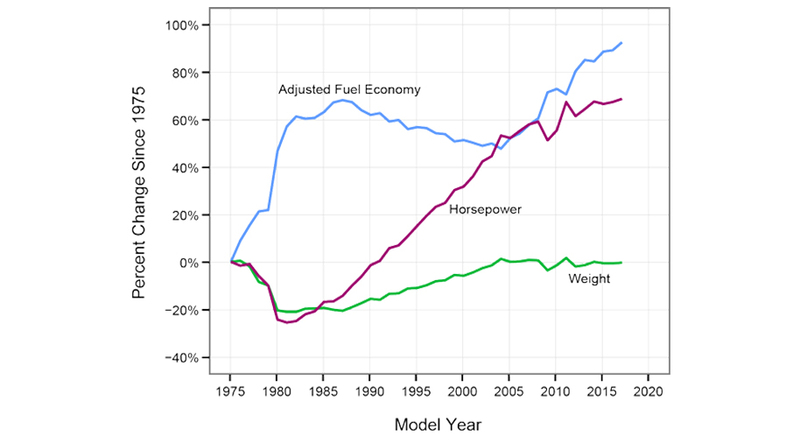 If fuel economy regulations were to disappear entirely, the biggest winners would be the auto companies, since they would be free to manufacture the larger, more profitable vehicles without having to invest in technology to make vehicles more fuel efficient. If the tough standards remained, car companies would need to continue substantial investment in fuel efficient technologies and produce vehicles consumers may be less inclined to buy. The oil industry would stand to gain without any standards as well, since more gas-thirsty vehicles would be on the road, while demand for oil would likely go down under a tight regulation scenario. Consumers would both win or lose if fuel economy regulations went away. They might have more options in larger, more powerful vehicles. But they’d be paying more for gas for less efficient vehicles — and they (along with everyone else) would face the consequences of adding more climate-changing greenhouse gases to the atmosphere. With no fuel efficiency regulations, the electric vehicle industry would stand to lose. It’s doubtful that car companies would make the kind of investments they are today in an electric vehicle fleet without regulations and incentives. If, on the other hand, strong standards remain, there could be a furthering and acceleration of investments in this industry. Removing all fuel efficiency restrictions would likely cause us to go backwards environmentally. If tough standards remain, on the other hand, the environment stands to win. Even if consumers don’t flock to new fuel efficient cars in large numbers, all vehicles would eventually achieve a greater level of fuel efficiency, resulting in lower CO2 emissions. That said, if consumers continue to gravitate towards large vehicles and shun electric vehicles even with regulations, it would present obstacles to achieving the regulation’s goals. Few would argue with the ultimate goals of a thriving industry, clean air and satisfied consumers. But it’s debatable whether either scenario — having no standards or staying the course with 54.5 mpg — would achieve all those goals, and how it would happen. To get consumers to buy more fuel efficient cars might mean incentives for auto companies to better market and educate consumers on the merits of extremely efficient vehicles. Or, Lee suggests, it might just mean tweaking the standards so they require a small rollback of a few miles per gallon. That — and some more flexibility in meeting the requirements — was what automakers seemed to be asking for when they initiated their conversations with Trump in the first place. In the end, perhaps that’s what they’ll get. I'm surprised that the all important question of the price of fuels is not considered in the text - or just very lightly and just incidentally considered. If the price per gallon would be increased (through taxes, for example) to the international levels as in Europe and South America, all the other considerations in the text will surely be thrown away. If the government is willing to set standards, why wouldn't be able to rise taxes? The whole discussion on standards and cost of fuel efficiency for automakers would be inmaterial. Consumers don't really care too much for emissions or climate change unless they are forced to care through the wisdom of pockets. Your article takes no account of the health harms and costs associated with tailpipe emissions. This article is heavily weighted towards what industry wants (profit) rather than what is in the public interest. Our CO2 budget for 1.5C will be gone as of about Jan 1, 2020. The budget for 2C is around 2031. So talking about rolling back anything with respect to cars (or even the opposite and halving their emissions) is spitting in the wind, irrelevant. Its quite simple; 90% of the cars on the road today need to be recycled into bikes and trains. Those saying "EVs will save us" are forgetting the fact that a smallish EV car requires about 8 tons CO2 to manufacture them. That's about a 1/2 ton per year. I'll use that emissions budget to eat.